This is the first of my EASY TO DO Halloween make up looks. Halloween is a time for FUN. Not everyone is able to acquire the makeup needed for a super difficulty Halloween look. So here is my easy to do Step by step. I personally used MAC and Illamasqua to create the perfect coverage and white. Now, White make up. It is the run up to Halloween act fast and you can pick up white face paint/face make up even in a newsagents. You really do not NEED to use a well known brand. If the white you get is too chalky, mix a tiny bit of moisturiser in with it and it will make it easier to work with. 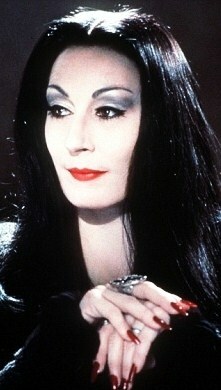 Morticia is bone white, the emphasis is on the heart of her face. Blanch out your face evenly. Take your normal face powder (I used MAC studio fix in NW15) and powder along your hairline (lightly) and down your cheek bones. This makes your face pop and adds a real depth to the face. Next step is the eyebrows Morticia’s are very rounded and fine. My eyebrows are quite thick naturally so I had to work with what I have and did my best to replicate them. I was going to glue down my eyebrows and cover them, but that would complicate the easy to do nature of this look. I used a white eyeshadow, MAC CHILL. I applied it all over my eyes using a fluffy brush. Focusing directly under my eyebrows. I then used MAC SCENE, But gray shadow will work just as well. I applied the gray only to my crease and blended it out. I didn’t use a lot of product, when you are pale dark colours pop regardless of the amount used. I then applied a tiny amount of black eyeliner along my lashes, there is a very SLIGHT cat eye. Line your lips with any red pencil you have, I lined mine with brick by MAC and made my cupids bow pointy. I then filled in with Russian red, again by MAC. BACK TO EYES... BECAUSE I TOTALLY FORGOT TO FINISHT THEM BEFORE I MOVED ON TO MY LIPS Apply eyeliner to the waterline. Apply lashings of Mascara and you’re good to go. You rock her look so well, gorgeous amor. Katie you were born to wear this look!